Cold weather be damned, I wanted a summer pie! I stumbled upon the recipe below and thought I’d give it a whirl even though I’ve only made one other pie crust from scratch before (they can be intimidating to make). 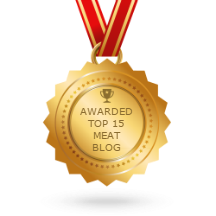 Despite the lengthy time this recipe takes, it’s worth it. It’s one of the best buttery and flaky pie crusts I’ve ever had and the filling was delicious. 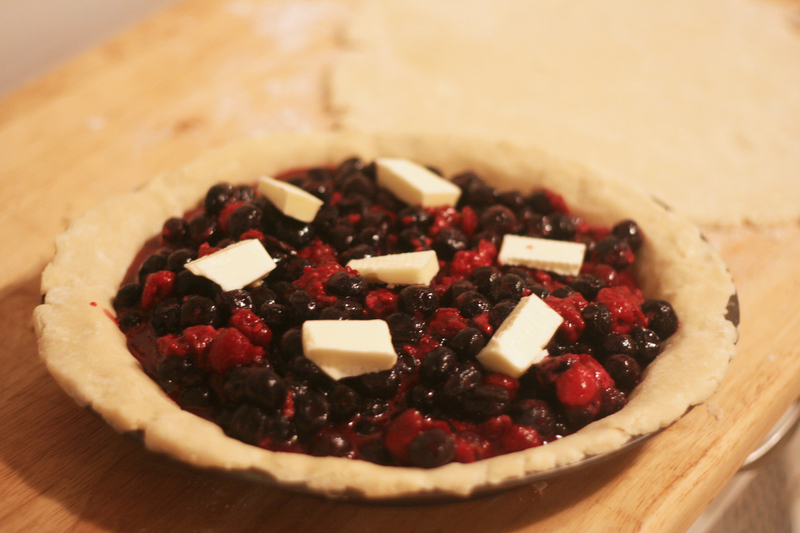 I’m already dreaming up the endless pie possibilities in my future using this tasty crust recipe. Before you’re ready to make the pie, freeze two cut up sticks of butter into smallish (about 1/2-inch) cubes, and put it into the freezer. The colder the butter the better luck you’ll have with creating a flaky crust. Freeze the butter at least 15 minutes, better an hour, best overnight. 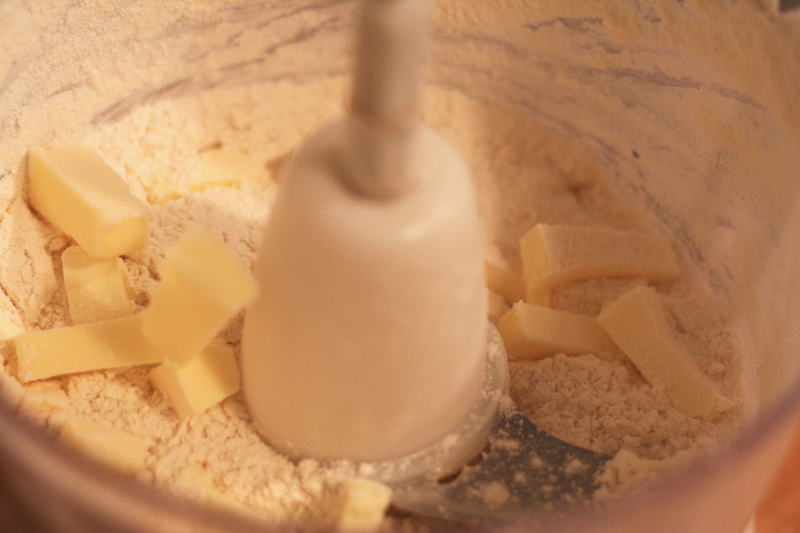 Then place the flour, salt, and sugar into a food processor and pulse until well combined. Add half of the butter cubes and pulse 6 to 8 times. Then add the other half of the butter cubes and pulse 6 to 8 more times. 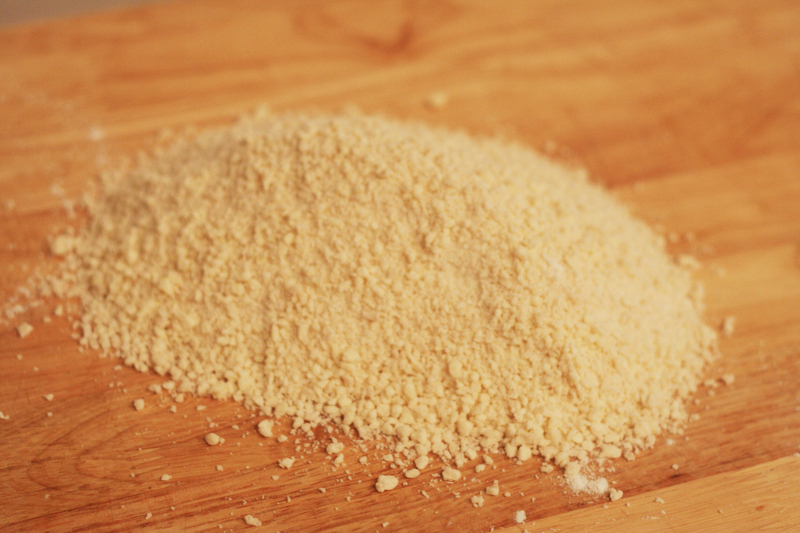 You should have a mixture that resembles a coarse meal, with many butter pieces the size of peas. Use your hands to press the crumbly dough together and shape into a disc. Work the dough only enough to just bring the dough together. Do not over-knead or your crust will end up tough. You should be able to see little bits of butter, speckling the dough. When these bits of butter melt as the crust cooks, the butter will help separate the dough into flaky layers. So, visible pieces of butter are a good thing, what you are aiming for, in the dough. Sprinkle the disc with a little flour on all sides. Wrap the disc in plastic wrap and refrigerate at least 1 hour. When you are ready to roll out the dough, remove the disk from the refrigerator and place on a clean, smooth, lightly floured surface. Let it sit for 5 to 10 minutes to take just enough of a chill off of it so that it becomes easier to roll out. Sprinkle some flour on top of the disk. 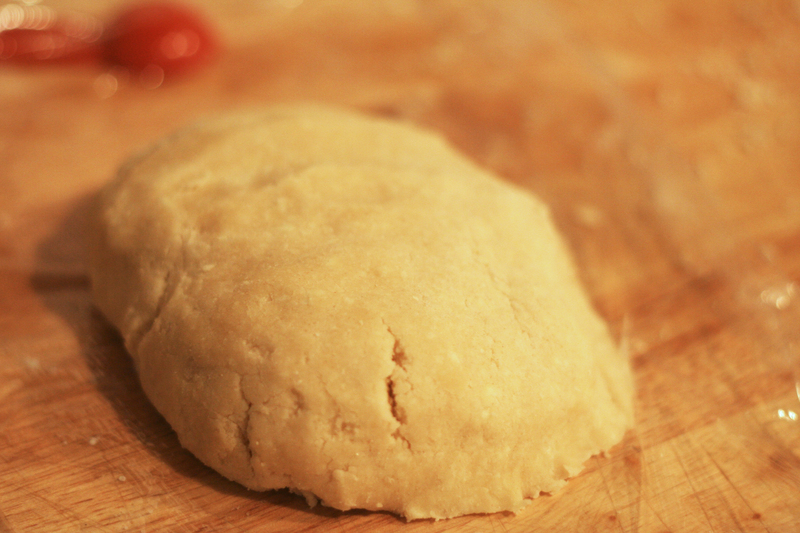 Using a rolling pin, roll out the dough to a 12 inch circle, to a thickness of about 1/8 of an inch thick. As you roll out the dough, check if the dough is sticking to the surface below. Add a few sprinkles of flour if necessary to keep the dough from sticking. 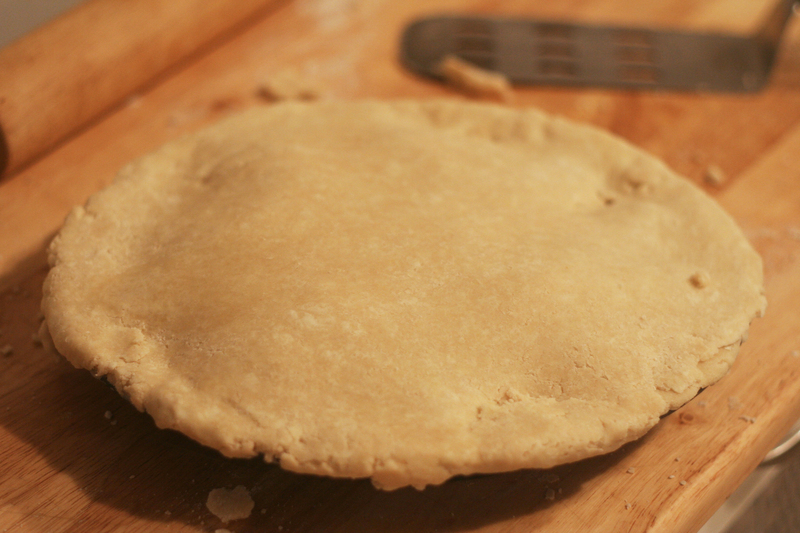 Place on to a 9-inch pie plate, lining up the fold with the center of the pan. Gently unfold and press down to line the pie dish with the dough. Refrigerate for 30 minutes. Transfer them to the chilled bottom crust of the pie pan. Dot with butter pieces. Roll out remaining dough to the same size and thickness as the first. 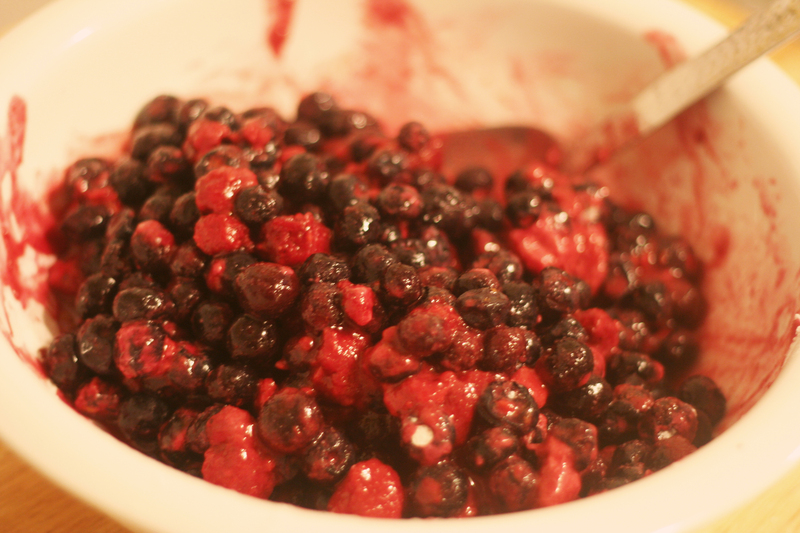 Place on top of the berry filling. 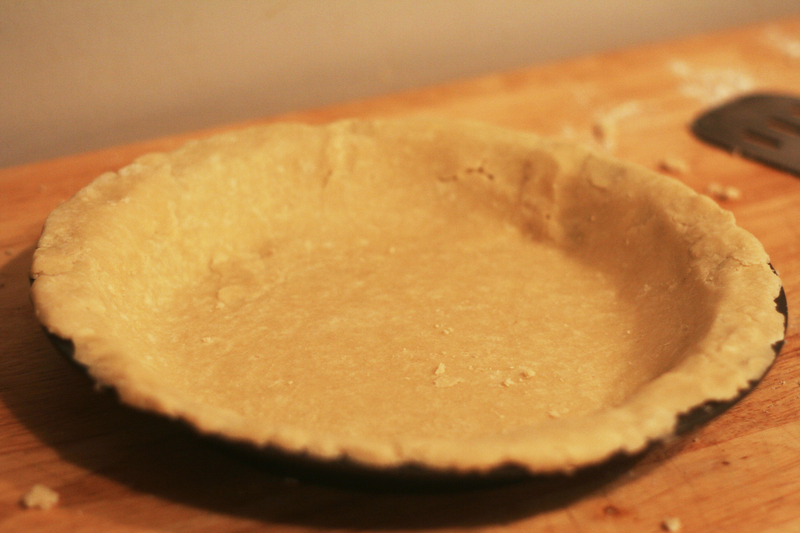 Tuck the top dough over and under the edge of the bottom dough, and crimp the edges with your fingers. 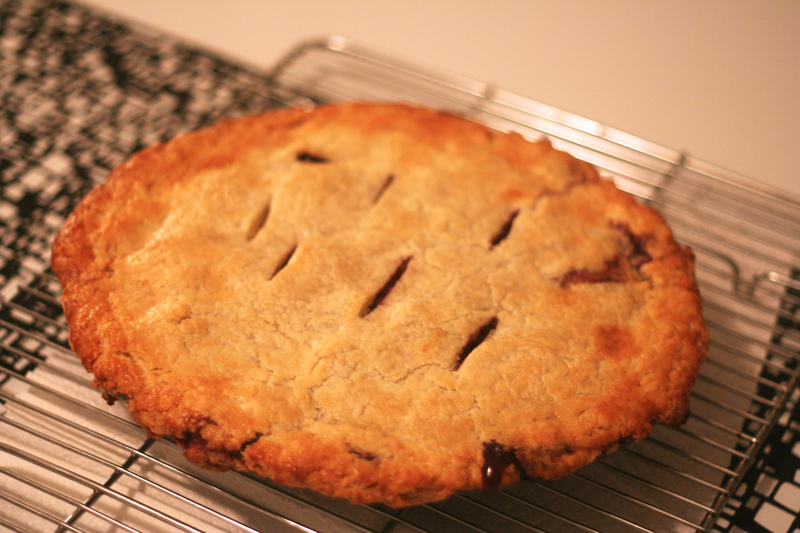 Transfer the pie to the refrigerator to chill until the dough is firm, about 30 minutes. Heat oven to 425°F. Whisk egg and milk together to make an egg wash. 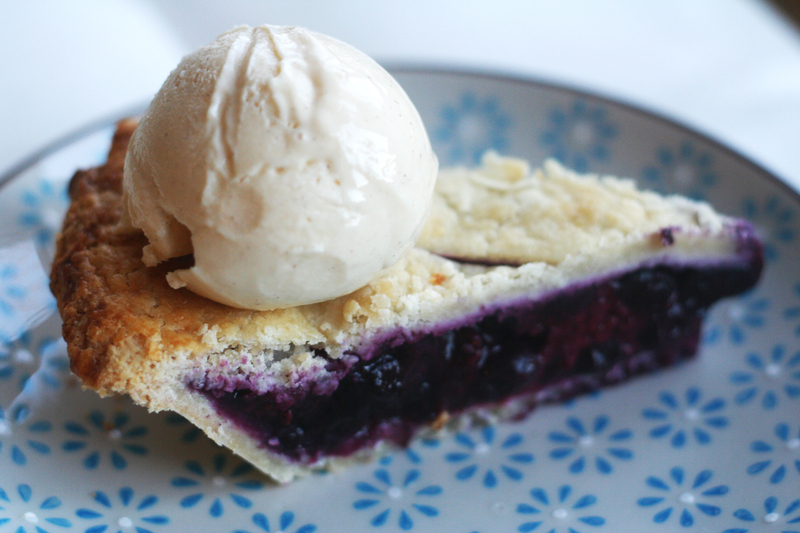 Remove the unbaked pie from refrigerator. Brush the top with egg wash. 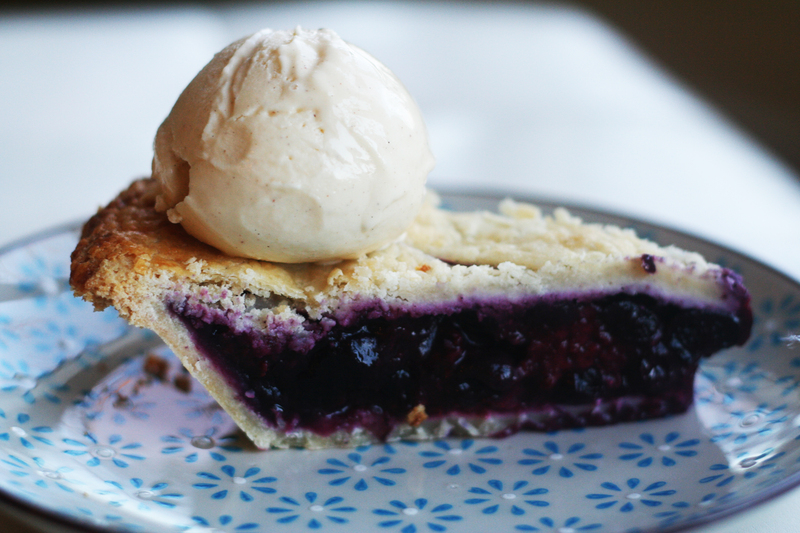 Score the pie on the top with 4 cuts (so steam can escape while cooking). Place the pie on the middle rack of the oven with a parchment paper lined baking pan positioned on the lower rack to catch any filling that may bubble over. Bake for 20 minutes at 425°. Reduce heat to 350°F and bake for 30 to 40 minutes more or until juices are bubbling and have thickened. Transfer to a wire rack to cool. Let cool completely before serving. This tasty recipe came from Simply Recipes.